Suspended from the ceiling, "Lead" shows the water contamination levels in Chicago neighborhoods. Visitors interact with "Globule," a tapestry representing water quality data from "Bubbly Creek." Guests watch messages pop up in the "Serendipity" installation. "Distracted Driving" explores statistics associated with texting and driving. Visitors watch YouTube videos in the "React" installation. A visitor sends a message to another guest as a part of the "Serendipity" piece. "72.100" displays a speculative solution to water contamination. Most people know that texting while driving is dangerous, so why do they continue to do it? This is one of the questions posed by Distracted Driving: The Choice is Yours, an artistic installation that transforms the abstract issue into a tangible, immersive graphics. The piece is one of the six final projects that emerged from “Data as Art,” a fall course co-taught by faculty from Northwestern University and the School of the Art Institute of Chicago (SAIC). Each interdisciplinary team included students from SAIC and Northwestern Engineering, which organized the collaboration through the Segal Design Institute. “We hope viewers will have a chance to look at their lifestyles and ask why they text and drive,” said Georgios Skoufalos, a recent graduate from Northwestern’s Engineering Design and Innovation project who worked on the Distracted Driving project. “We found that there are many excuses to text and drive but wanted to show that none of them are acceptable. 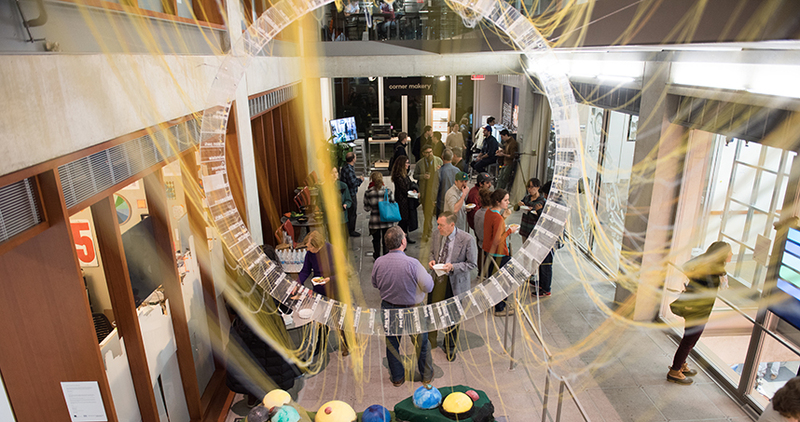 All five projects are currently on exhibit through February 17 in Ford Motor Company Engineering Design Center’s atrium on the Evanston campus. Supported by the Barry and Mary Ann MacLean Fund for Arts and Engineering, the annual course is in its fourth year and aims to challenge students from both institutions to work together to translate complicated data sets into visual art or images that an average viewer can understand. 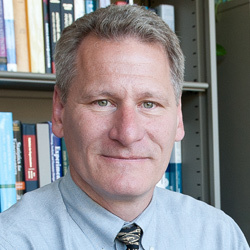 Participating Northwestern faculty include Bruce Ankenman, professor of industrial engineering and management sciences and director of Segal’s undergraduate programs; Malcolm MacIver, professor of biomedical engineering and mechanical engineering; and Jim Wicks, clinical associate professor in the Segal Design Institute. The many ways that cellphones have made a significant impact on everyday lives inspired the Distracted Driving team. According to the National Highway Transportation Safety Administration, texting while driving increases the odds of crashing by 23 times. Distracted Driving confronts the viewer with several statistics about texting and driving and allows them to reflect on the topic.